Not much has happened lately other than waiting, waiting, and more waiting. It just about kills us to watch all these huge Halibut and Salmon coming in off the fishing boats and not being able to go catch them. Our new outdrive left the San Juan Islands bound for Seattle yesterday afternoon. It left Seattle and arrived in Port McNeill early this afternoon and the mechanics got it installed by about 4PM. (We are taking the blown one back with us for an autopsy.) Our boat got back in the water by about 5:30PM, just in time for a big thunderstorm; the first one we’ve seen this summer. Nutz! We were hoping to cruise for a couple of hours tonight. The forecast is for severe thunderstorms and gale force winds. So, we’re staying put here for the night. Karl, Randy, Donna, Amber and so many others here at Quarterdeck Marina have been so nice to us. It’s great to see so much quality service again. 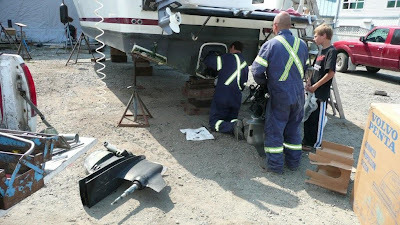 The Volvo Penta dealer in Port McNeill was great as were the folks at Kenmore Air and Ron Meng at Islands Marine Center. Everyone worked hard to get us back in the water. We also met a lot of other nice boaters on the docks. The boys saw a 27’ Skagit Orca go by and commented that it looked like our old boat. I looked up and said, “Hey, that IS our old boat!” We ran over to great Tom and Theresa Connelly, who bought it from us. They live just north of Nanaimo but were up here fishing and we just happened to run across them. The love their new boat and are really making good use of it. 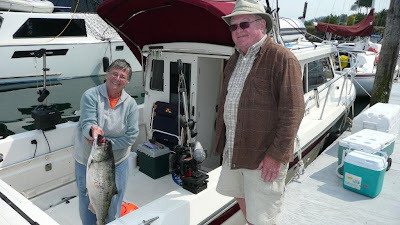 They came in with four really nice Coho and one nice King. Tom didn’t think it was that big but Theresa did. (Guess who caught it?) Cody spends time working on his school work. He’s getting a great jump on his senior year already. 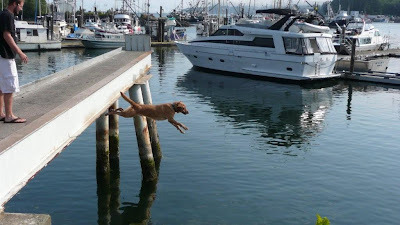 Connor loves talk to people on the dock and throw a lure at anything that moves (above and below the water!) 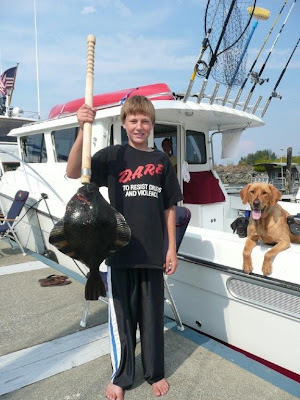 Last night, he caught two small Halibut right off the dock. (Actually, there was another name for them, but they looked like big sole or little flounder. Whatever they are, he had a great time catching them.) Tanner and Lucky enjoy all the attention they get from the passers-by. Val even got to walk to the mall today for some shopping. 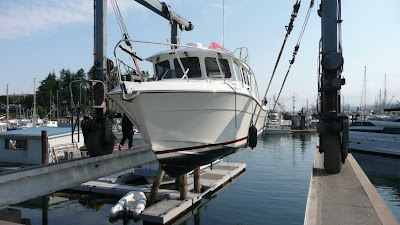 I enjoyed the whole boat lifting, fixing, process and was glad when everything checked out. We had pizza delivered to the boat tonight. We had our devotions and played our nightly game of poker. I did win the last two games and even had a true Royal Flush; which I’ve never seen before! But, Cody is really running away with the summer standings. Val is in a potential come-back second position (with some major luck.) I doubt if I can ever recover from my third place standing and Connor is dust in the wind.We’re thankful that we’re back in the water and that all the planes, people, and parts made it here. We’re praying for flat water tomorrow morning and we’re leaving at first light. So, I better get to bed. You should too. Good night and God bless you.